Happy Monday....today I want to share another sneak peak at the new sets that will be revealed on Wednesday at Sparkle N Sprinkle! They are awesome sets as you can tell...I so enjoyed playing again with them. I have this K&Co paper that is grays and blues with ivory cream base instead of white and I just love the softness that it gave my card. I also used the Splitcoasts Double Dutch technique for the card. 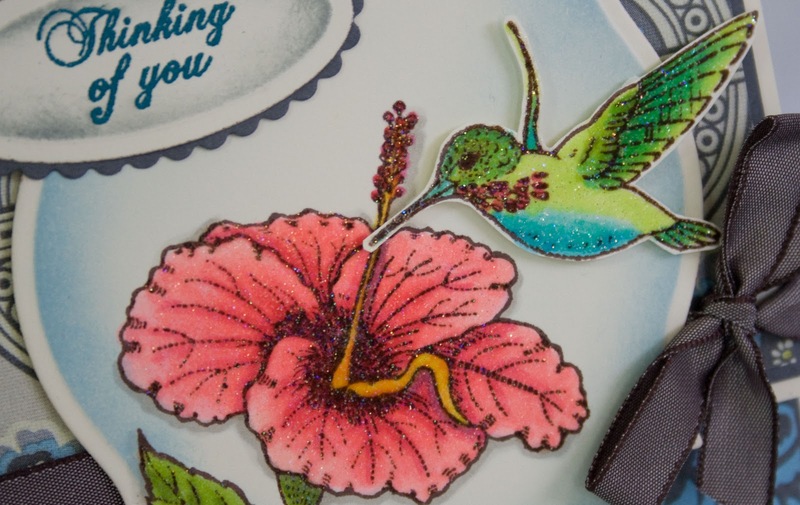 I stamped with brown Memento and colored with my Copics, but then I also used the Penboss embossing pen and colored just the flower and the bird and embossed them with Sparkle Embossing Powder to give them some more sparkle and pizzazz. Her is the inside of the card with a portion of another stamp in the set. Wait til you see the whole set! 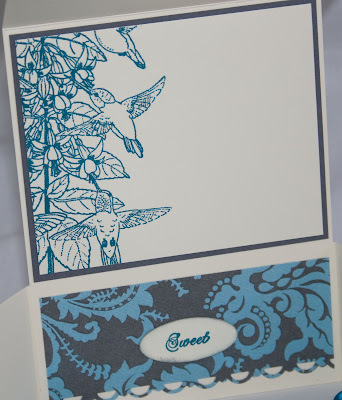 You are going to love them I tell you:) And with the Tuscany Mediterranean Embossing Powders....ummmmm beautiful! Here is a close up with the sparkle. The bird is cut out and put on dimensional tape. Come back on Wednesday as we reveal the whole sets and I share another card with you! Just beautiful Jill. I particularly like how you just used a portion of the stamp in the inside. Love the background colors. 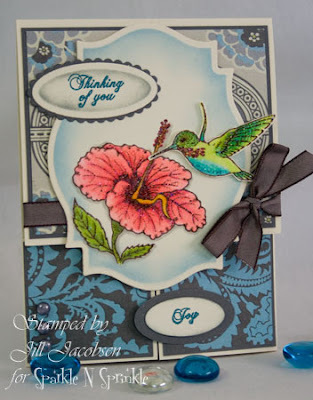 Beautiful cards, Jill! Can't wait to see what everyone has done with the new images! You are so creative. Love the colors. Gorgeous! I love your card. You did a great job! Love everything about the card! Very beautiful! I just love this set and the background paper really makes the flower and hummingbird pop!